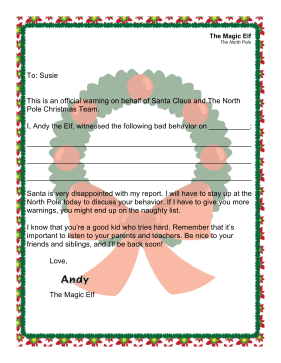 Perfect for naughty kids, this Magic Elf report card serves as a warning for bad behavior. This is an official warning on behalf of Santa Claus and The North Pole Christmas Team. Santa is very disappointed with my report. I will have to stay up at the North Pole today to discuss your behavior. If I have to give you more warnings, you might end up on the naughty list. I know that you're a good kid who tries hard. Remember that it's important to listen to your parents and teachers. Be nice to your friends and siblings, and I'll be back soon!